I came across this article dated May 7, 1908 in which the photo above appears. I can't exactly recall seeing this particular cuff before. 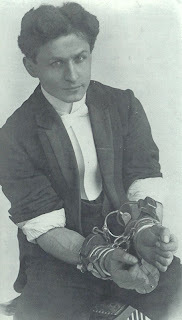 I've scoured the Houdini books and searched through a number of handcuff related sites and I've come up empty. The handcuffs were a special creation specifically designed to challenge Houdini. They were designed by Captain Edward Bean, the original creator of the Bean Giant Handcuffs. 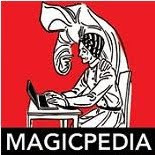 This is the name given in the article, but at least two of the Houdini biographies say the creator of the Bean Giants was Captain Charles Bean. I'm settling with Captain Edward Bean because Handcuffs.org has the name as Captain E. Bean and those guys know their stuff. According to the newspaper account, "the new cuffs look like an oxen yoke, are a foot long and weight ten pounds, and were designed to succeed the 'giants' as the best made handcuff...There is a separate key for each side, with the locks particularly inaccessible to the persons reach who has them on." 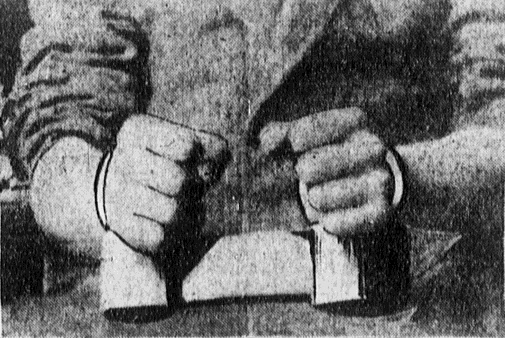 The newspaper refers to them as 'Trick Handcuffs' in the title, but there is no indication that they were actually 'tricked or gaffed' rather they were made to 'trick' Houdini. Unfortunately for history, this seems to be Houdini's final night of a run in Boston. I can't locate a newspaper account for the following day which describes the nights challenge. Though, we can assume that Houdini freed himself or that surely would have been written up in a lot of newspapers. 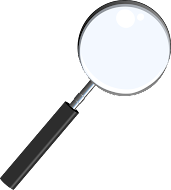 The next newspaper which carries news on Houdini is three days later and he is in Pennsylvania at that time. The Bean Giants Handcuffs were once thought to be the toughest handcuff out there. Captain Bean offered an award to anyone who could get out of the handcuffs. Houdini took on the challenge and won, to the amazement of Captain Bean. Captain Edward Bean invented the Bean Giants (1887), Bean Patrolman Cuffs(1882), Bean Prison Cuffs (1882) and a variant of the Bean design known as the Bean-Cobb was invented by Lyman Cobb in 1899. The photo to the left shows Houdini with a number of different handcuffs on. The pair closest to his body are Bean-Cobbs, a popular handcuff with Houdini. I can't quite make it out but I think there might be a pair of Bean Patrolman cuffs in that mix as well, or it could just be another pair of Bean-Cobbs. 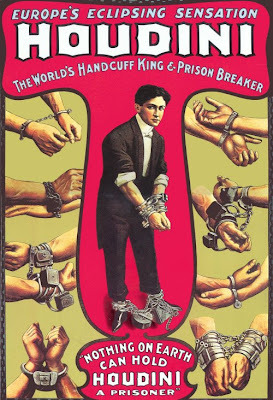 The famous Houdini handcuff poster below has Houdini wearing all sorts of interesting cuffs. He has on one pair of Bean Giant cuffs and a pair of the Bean-Cobbs. The Bean Giants are on the right hand column at the top, the Bean-Cobbs are in the center image in the same location as the photo, closest to his body. UPDATE: The cuffs were being discussed over at handcuffs.org. Bruce Thomson said "Is it just me, or do they seem to look like the cuffs in the poster for the Russian carette, which look like two huge cans of soup under the bow arms. Closest image I can find." They sure resemble the cuffs in that picture except that challenge was 1904, and these unusual Bean cuffs were introduced in 1908. Next Steve Santini offered this "Contain a "Scandinavian" padlock type mechanism comprised of rotating discs. In fact, they are actually scaled up padlocks with solid cast lock bodies and connector. Currently, they reside in David Copperfield's collection." And then he added "I think it highly unlikely Bean made these. They were more likely made by one of makers of the Scandinavian padlocks like Star or Climax or even perhaps Romer." I'm only going by what the newspaper article says "They were designed and made by Capt Edward Bean, formerly of the Chelsea Police force and a captain in the Civil War. 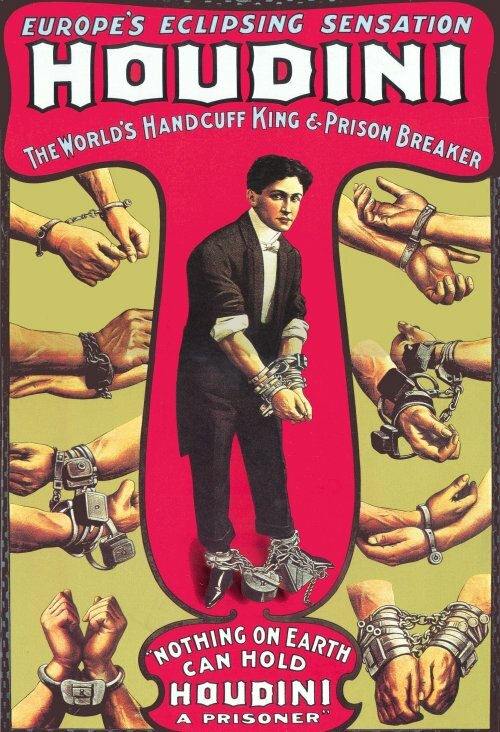 He is 70 years old and has the distinction of inventing the original 'giant handcuffs' of which Houdini says 'The 'giant handcuffs are acknowledged the best made and hardest cuffs to get out of in the world.'" That being said, it's still very possible that they were made by someone else as Steve suggests and the whole challenge orchestrated by Houdini. It would not be the first time he orchestrated a challenge! I greatly appreciate the help and knowledge offered by Steve Santini in locating and giving more information on this very strange looking handcuff. Well this is major! An unknown pair of Bean challenge cuffs? How have we never heard about this? Amazing. Great work. Have you posted about this on Handcuffs.org? As you say, they know their stuff! BTW, is that a photo of Houdini in the cuffs? Doesn't look like his hands to me. It is the picture from the newspaper. But it doesn't say it was Houdini in the cuffs.